Indonesia Tours - Book Amazing Package Holidays to Indonesia here! Indonesia is a volcanic island nation with 18,000 islands and a history and culture dating back thousands of years. 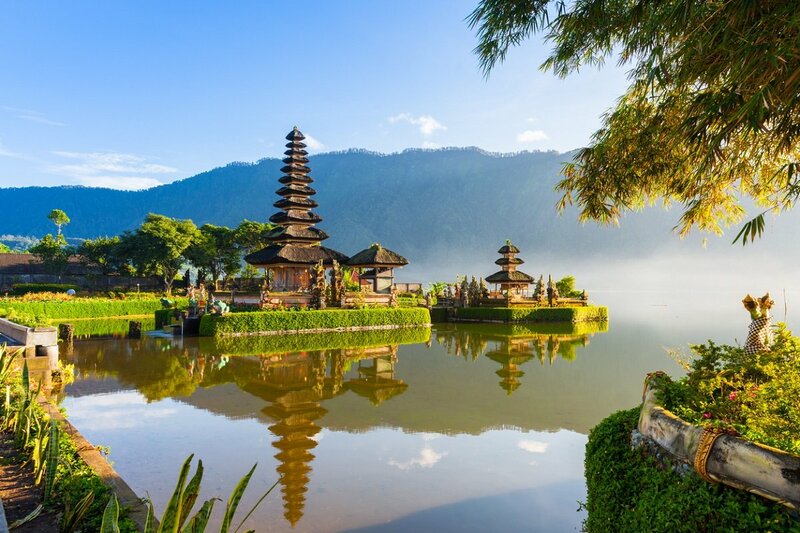 Visit Indonesia’s beautiful islands, for instance Bali, Java, Sumatra or Sulawesi on one of our exciting Indonesia tours. Check out all our tours to Indonesia below. Experience the wonderful island of Bali with its beautiful natural scenery, turquoise water and welcoming local population. 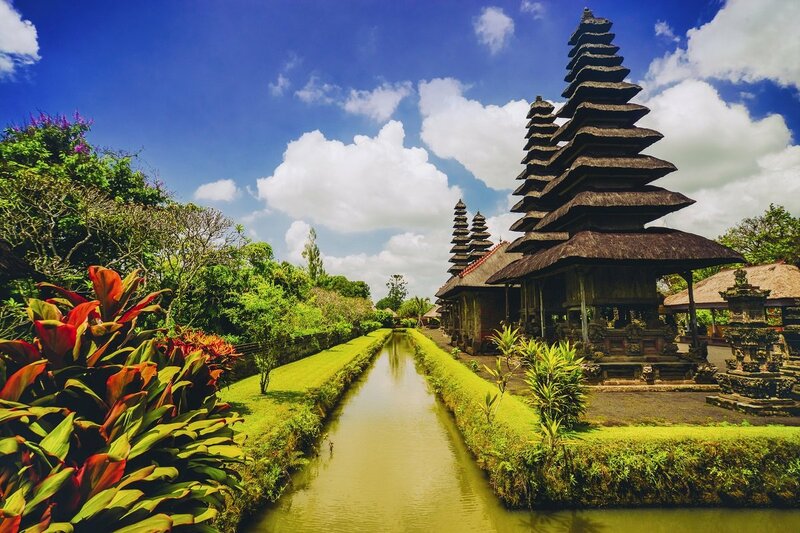 Discover the enchanting town of Ubud at your own pace and round off with a beach holiday in Seminyak. 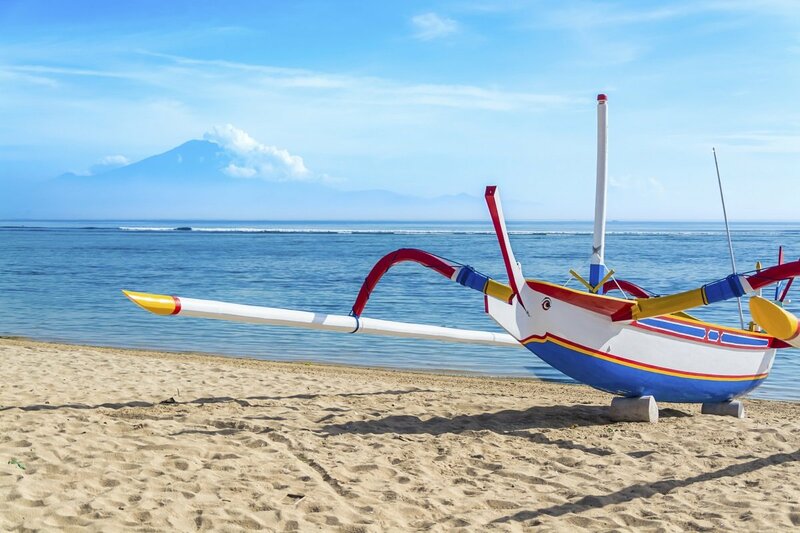 Immerse yourself in unforgettable experiences on Bali in Indonesia, also known as the ‘Island of the Gods’. 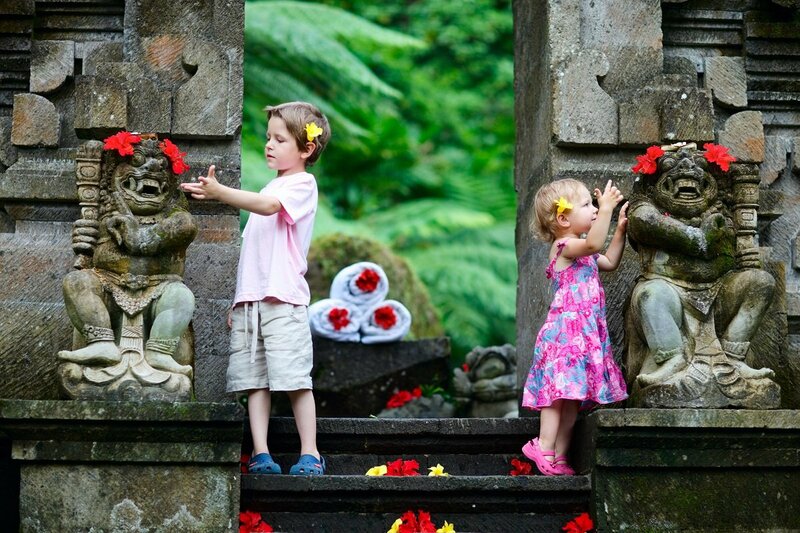 An exciting tour of Bali including child-friendly excursions and accommodation at hotels with family rooms. 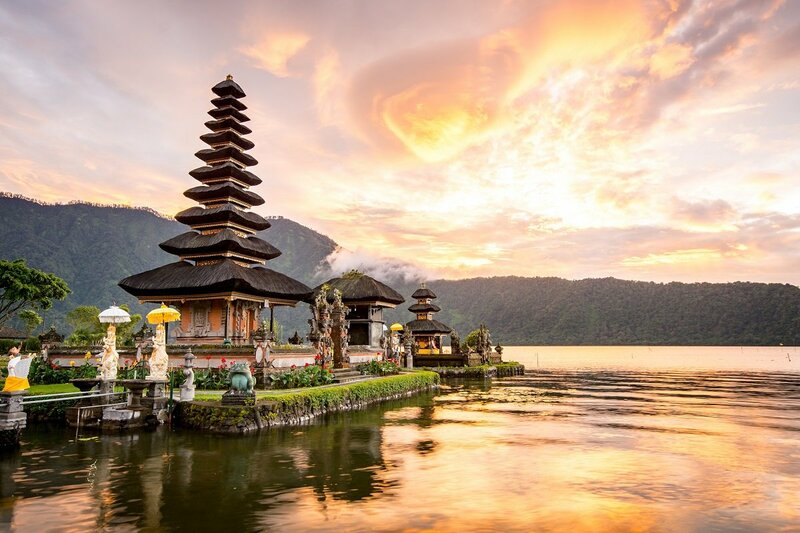 Experience active volcanoes, irrigated rice fields, temples, traditional villages and finish off with a beach holiday in Bali. 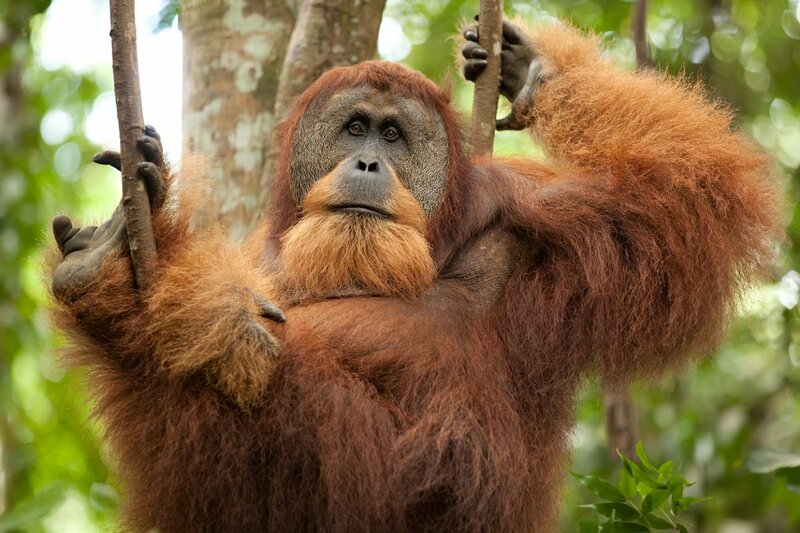 Discover the Sumatran orangutan, tropical rain forests, waterfalls, paddy fields and the exciting culture. Fascinating Sulawesi presents everything from lush, varied countryside to inspiring culture and crystal clear seas. Why should you holiday in Indonesia? Indonesia consists of 18,000 islands spread across an area from the Asian mainland to Australia. Not only does this mean great geographical differences but large historical and cultural differences, too, making Indonesia an exciting travel destination. Indonesia is located on the Pacific “ring of fire”, which is the term applied to the chain of volcanoes around the Pacific coasts. Travel to Indonesia and experience soaring volcanoes, amazing temples, wonderful tropical beaches with some of the world’s best coral reefs, exciting wildlife and a diversity without equal. You could spend months travelling in Indonesia, but at the heart of the island nation are four of Indonesia’s most exciting islands. Each island has a character of its own, and even after a short trip from island to island, it feels like arriving in a whole new country. 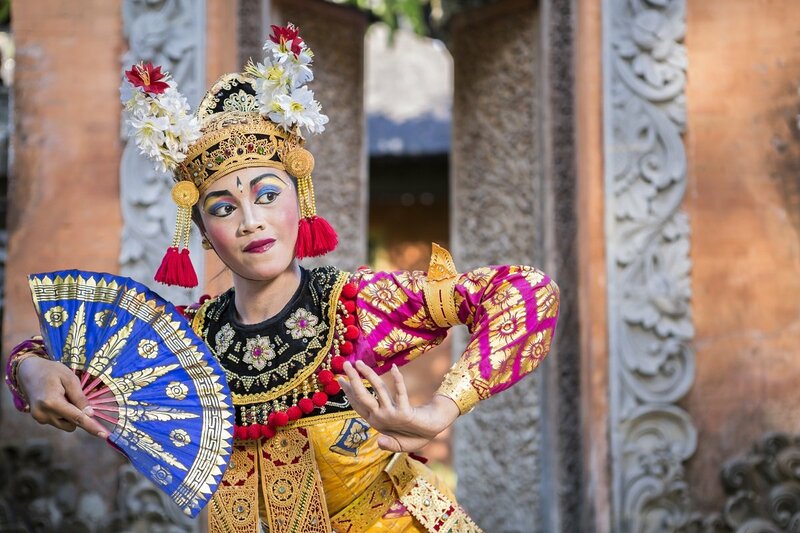 Our tours to Indonesia are each based on four of the most exciting islands: Bali, Java, Sumatra and Sulawesi. Read more about the experiences that await you on a holiday on the different islands below. Bali, or the Island of the Gods, is one of Indonesia’s undisputed highlights. The little island offers majestic scenery, beautiful Hindu temples and white bounty beaches, which are perfect for the beach holiday of your life. 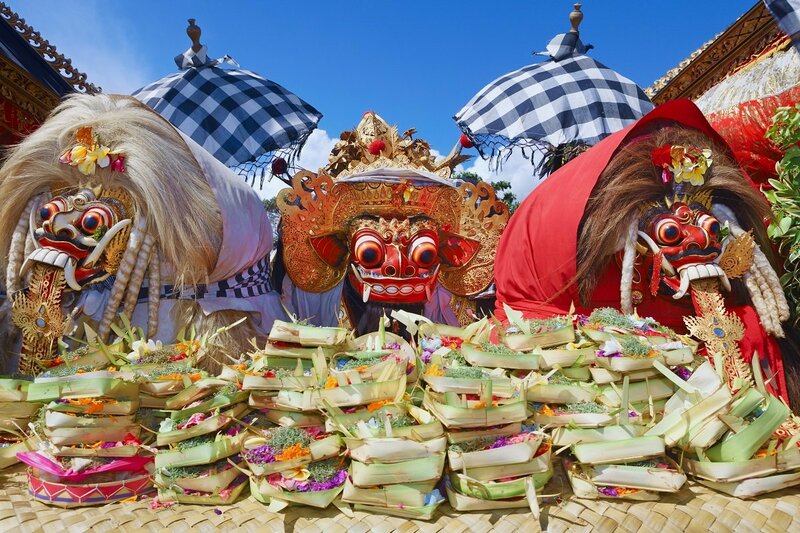 We offer several different tours to Bali, including in combination with Java. 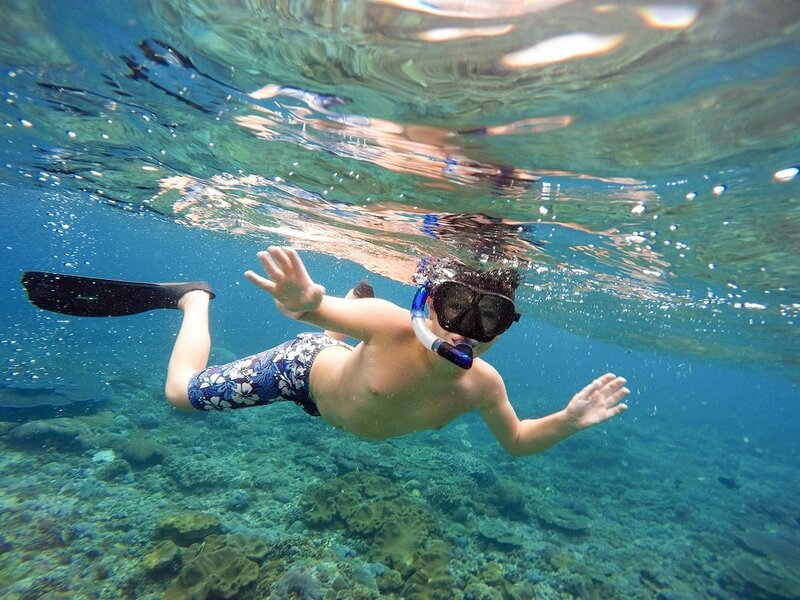 Selected tours can be rounded off with a tour to Komodo Islands or the Gili Islands. 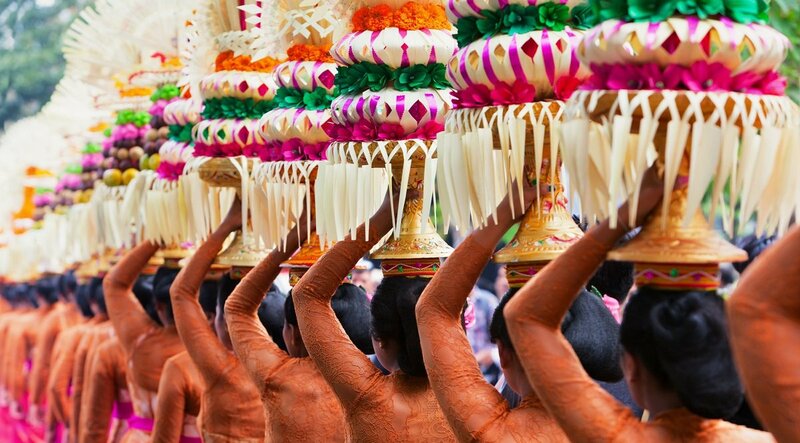 Ubud is the cultural heart of Bali and a must-see on your tour. 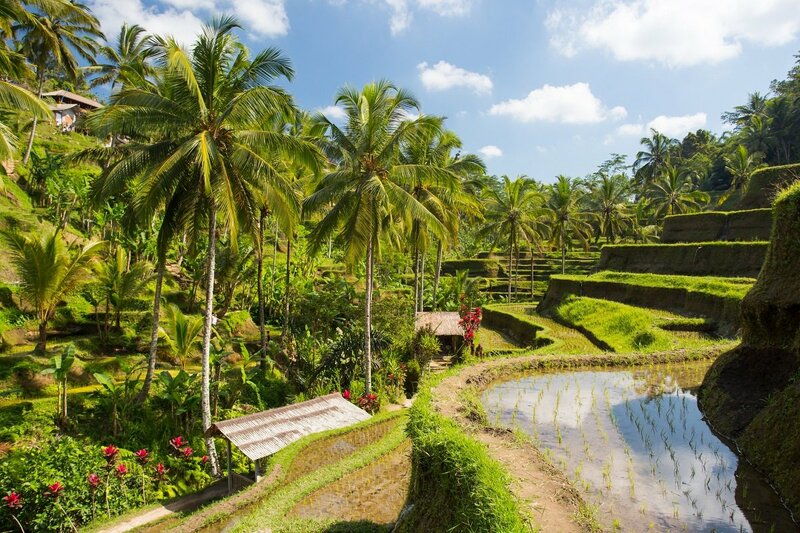 Ubud is scenically located between lush mountains and emerald green rice terraces. Explore the town by bicycle or visit some of the surrounding crafts villages. There’s no escaping the beautiful Hindu temples on your tour, which exist in their thousands. 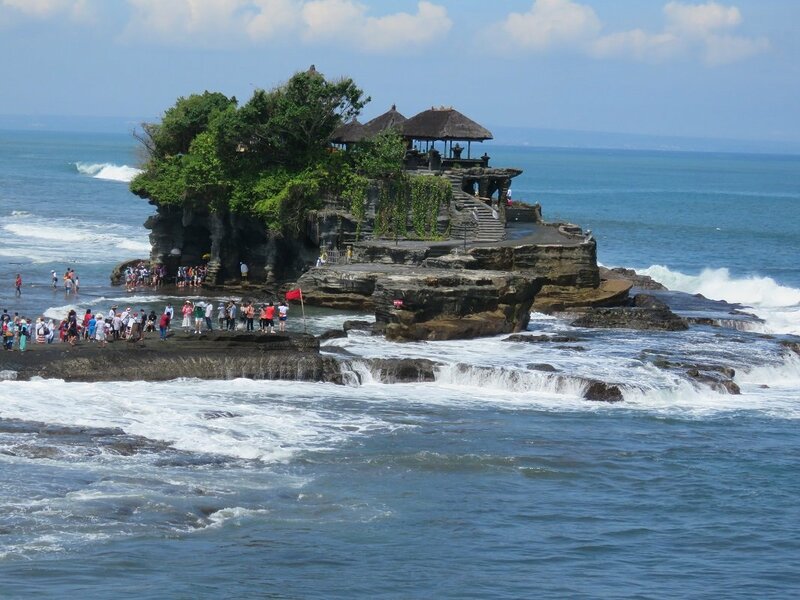 Visit, for example, the Besakih Temple, Bali’s most important and most sacred temple, or Tanah Lot, which is beautifully located by the sea and is one of Bali’s most important landmarks. 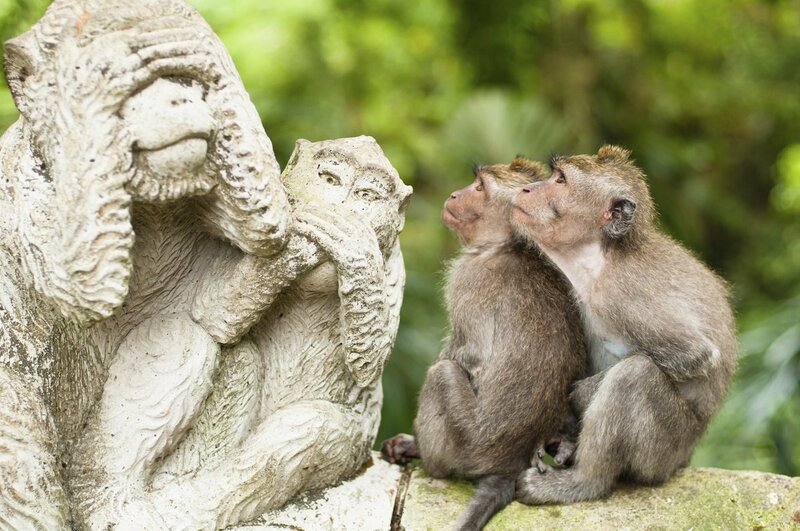 Bali also has a lot to offer in the way of nature and wildlife. Bali National Park is home to the highly endangered Bali myna bird and the park is the ideal place to go trekking. 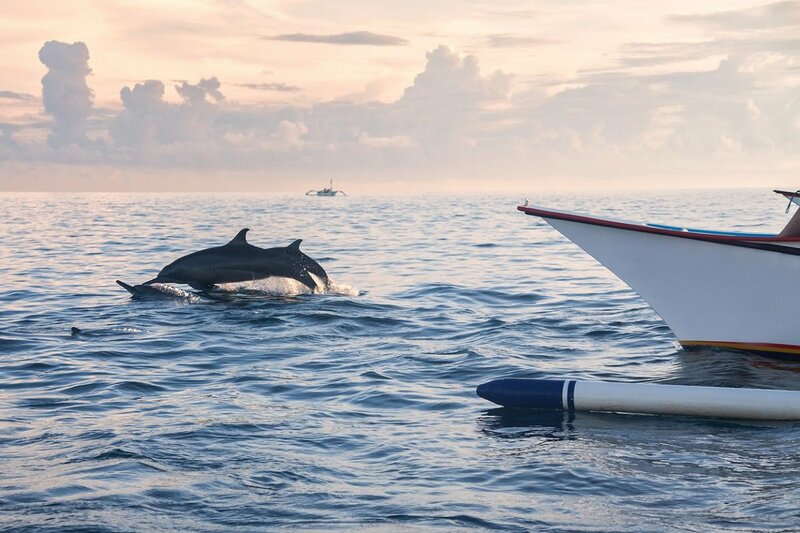 On the island of Menjangan, you can snorkel at the world famous coral reef, and Lovina Beach offers playful dolphins. 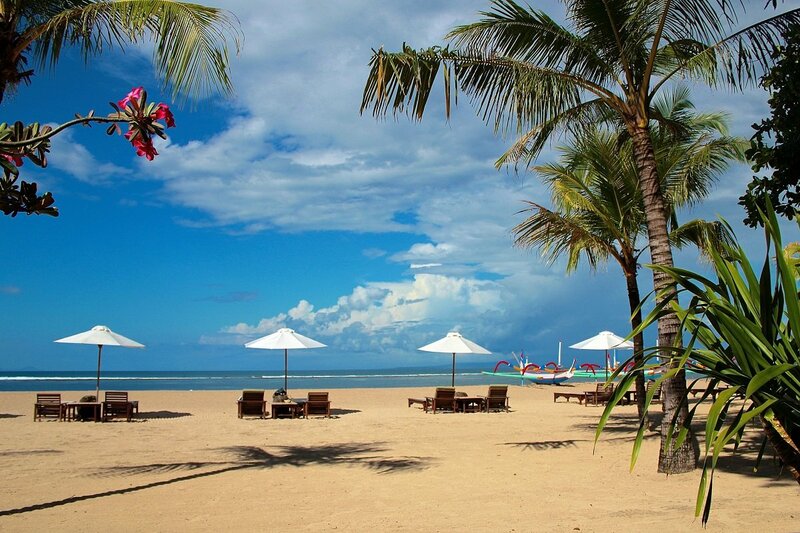 Bali’s beaches are quite outstanding. 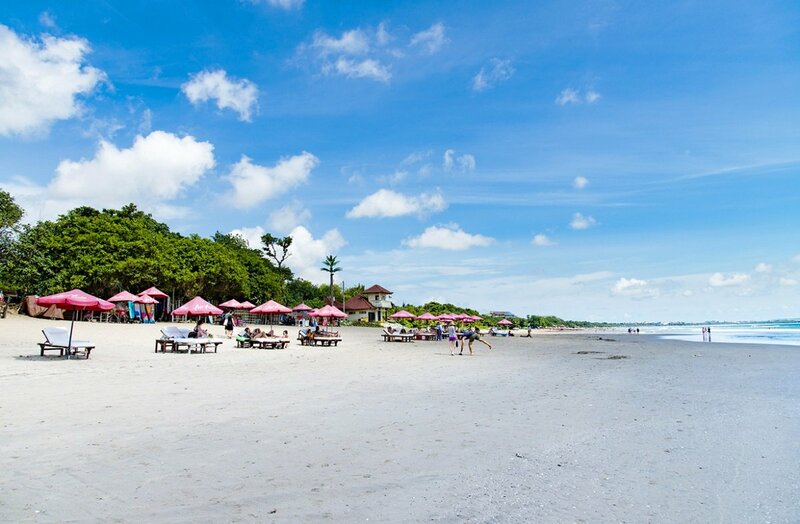 Round off your holiday with a beach holiday in Sanur, which, with its miles of white sandy beaches is one of Bali’s most popular seaside resorts, , or in Seminyak, which is known to be Bali’s hippest and most exclusive seaside resort. Java is one of the world’s most densely populated islands, but you have no perception of this outside the towns and cities. 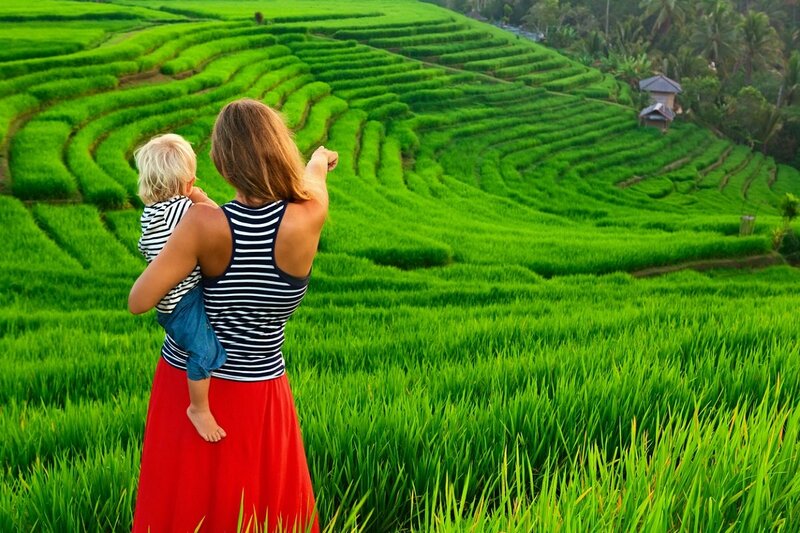 Java is located on the Indonesian “ring of fire”, and wherever you are, you will enjoy a fascinating landscape with scenic rice fields and conical volcanoes in the background. Java’s soul in Yogyakarta. 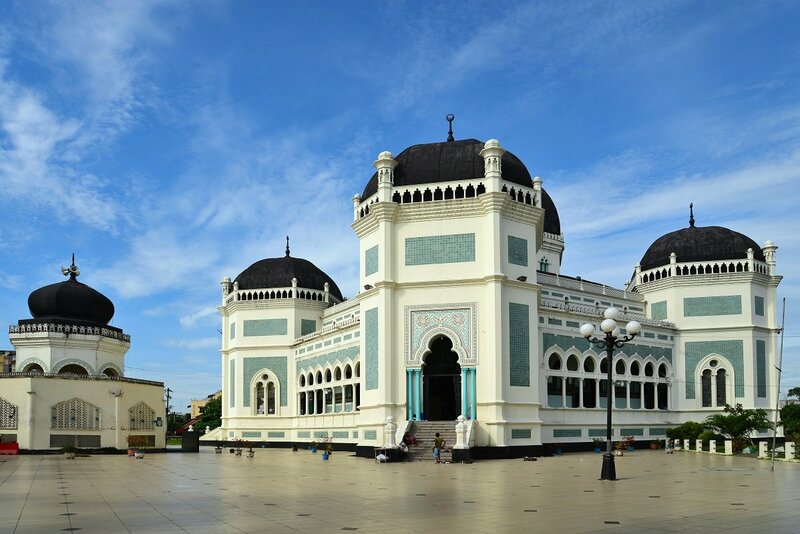 The city offers several palaces, including the Sultan’s Palace Kraton Yogyakarta, colourful markets and proud traditions of batik and other Javanese handicrafts. 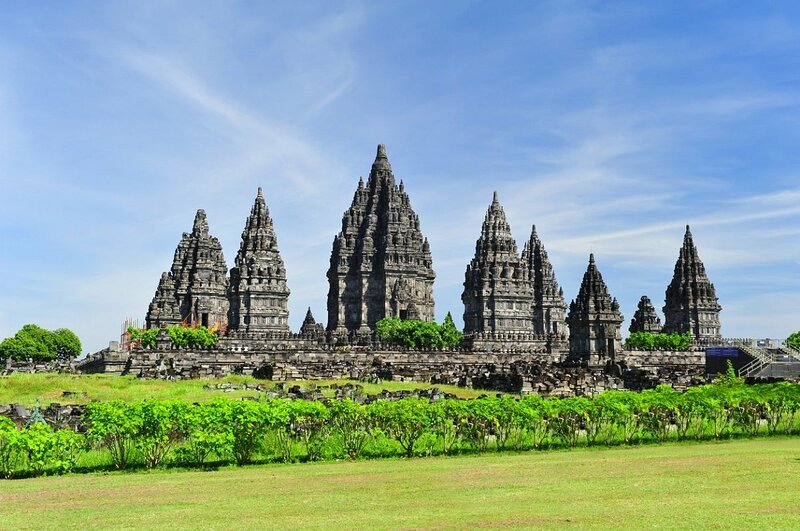 Visit the magnificent, UNESCO-protected Borobudur Temple north-west of Yogyakarta. 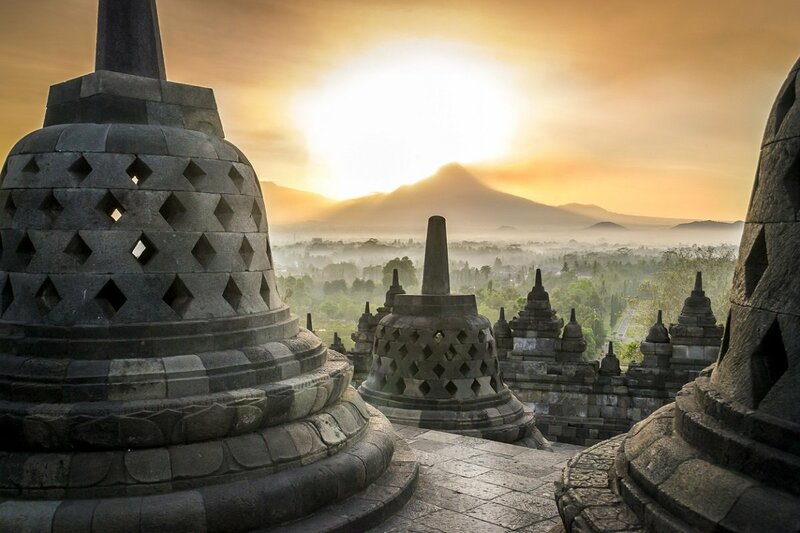 Borobudur dates back to the 8th or 9th century and is one of the world’s largest Buddhist monuments. Don’t miss Java’s beautiful volcanoes. 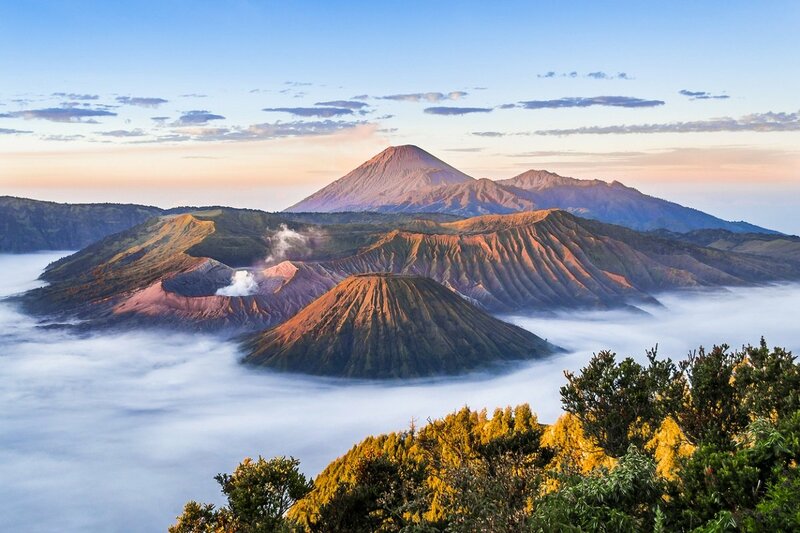 Experience the sunrise on the Mount Bromo volcano and trek to the top of the smaller Mount Ijen volcano, where you can experience the beautiful turquoise crater lake at an altitude of around 2,300 metres. Sumatra is Indonesia’s largest island, offering real adventure in the form of unique scenery with tropical rainforests, rivers and lush volcanic landscapes. The Gunung Leuser National Park is one of Sumatra’s main attractions. The national park is known for its dense rainforest, which is home to one of the last orangutan populations on Sumatra. See the beautiful animals in their natural habitat in the park. 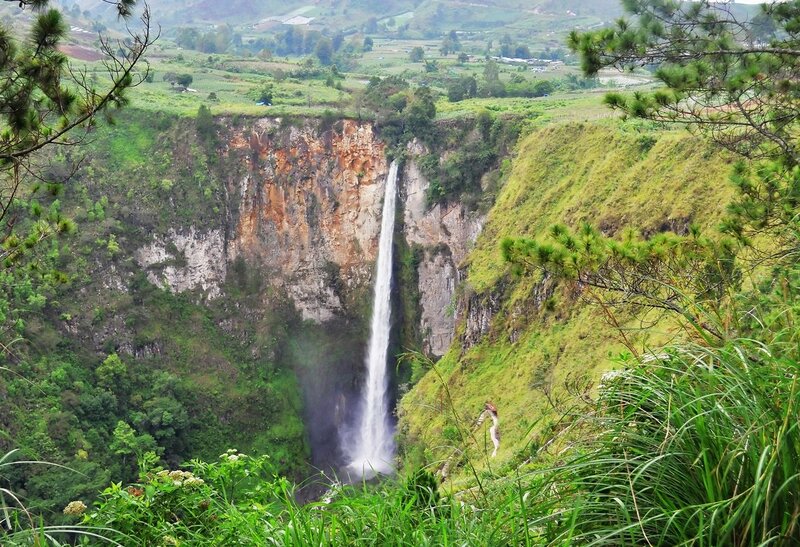 Discover Sipiso-piso, one of Indonesia’s highest waterfalls , at 120 metres high, and the world’s largest crater lake, Toba. 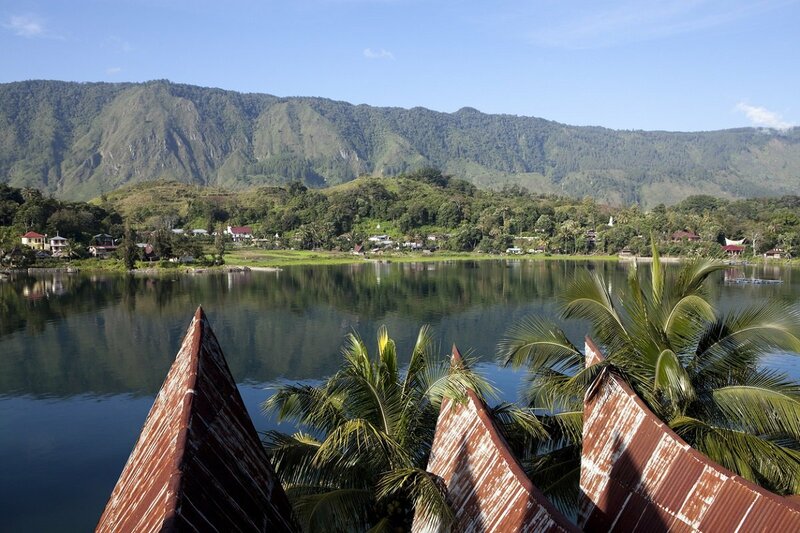 By Lake Toba, you will also find the beautiful, boat-shaped long houses in the local villages. Meeting local tribespeople. 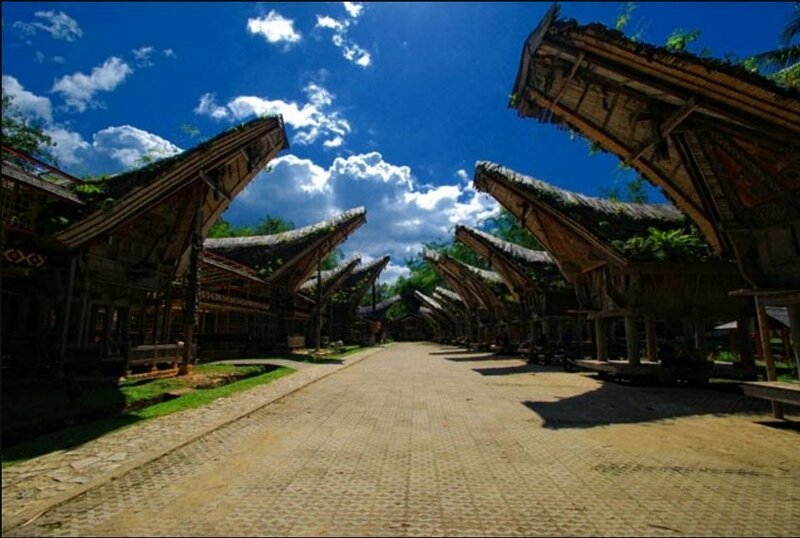 In the Batak Karo villages, you can experience traditional longhouses, where up to 12 families may be living at once. The tribe is particularly famous for their iconic, boat-shaped roofs. Few people visit Sulawesi, but the adventurers who do can enjoy wild nature and some of Indonesia’s most fascinating and exotic tribes. 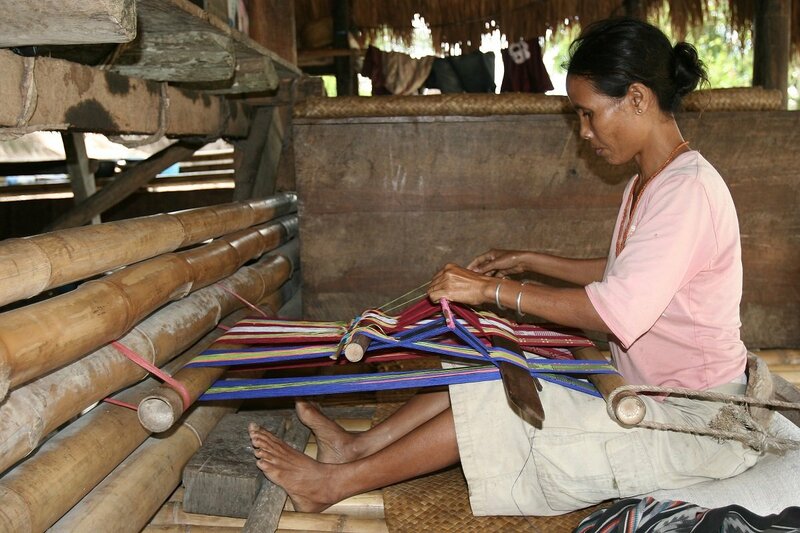 Visit the local Kajang tribe in Tanjung Bira. The tribal people live in the forest and are guided by animistic beliefs. They only wear black, as this is the first colour you see when lying in your mother’s belly, and the last one you see before leaving this world again. Gain an insight into the fishermen’s everyday lives on Lake Tempe, where they live in floating houses. 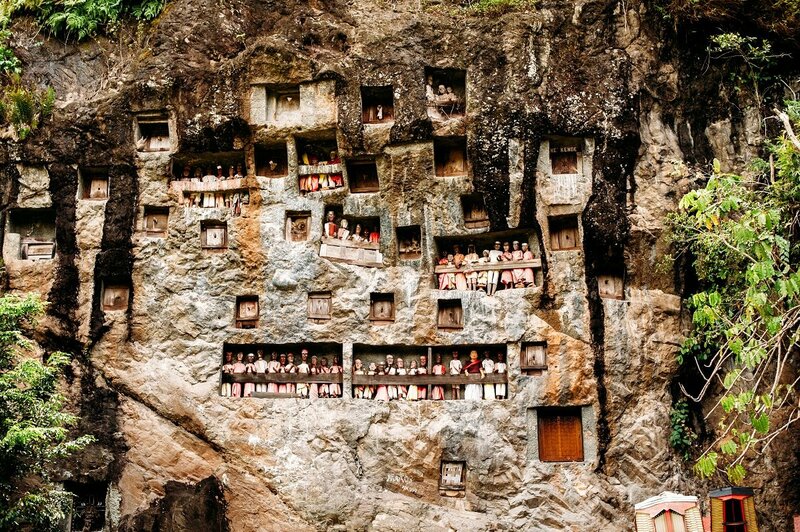 Visit the enchanting Toraja highlands, with small villages and rolling rice fields. Here, you can meet the Torajas, descendants of boat people, who now live in houses with boat-shaped roofs. 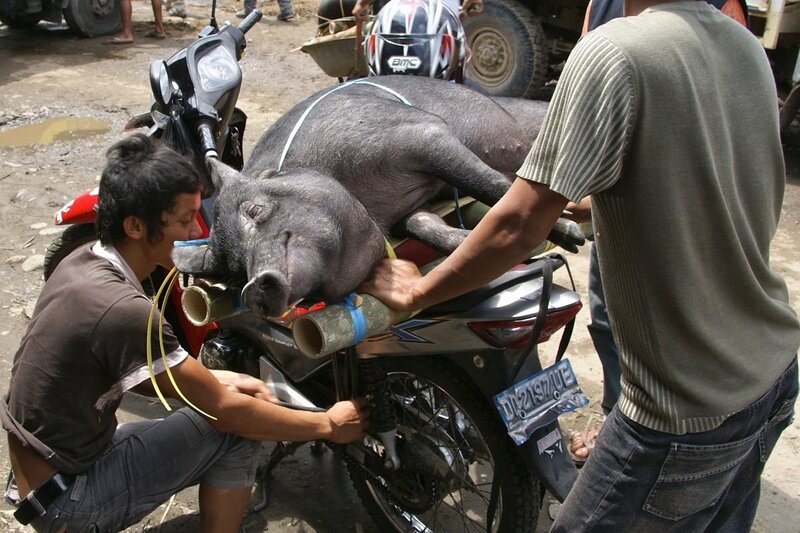 Want to know more about our tours to Indonesia? Our tours are package holidays, including flights, hotels and excursions. On our tour pages, you will find more information about what you can experience on the tour, including the highlights of the tour, the itinerary, what is included, the price and much more besides. 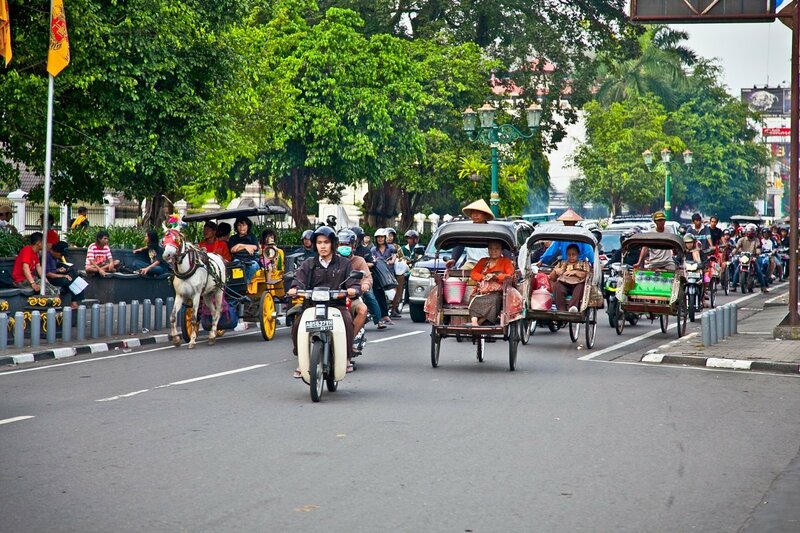 You can also obtain more practical information about travelling in Indonesia on our “Practical information” page. If you have any further questions about Indonesia, about booking the tour or about our other tours in East and Southeast Asia, you are very welcome to contact our travel consultants, who have extensive experience of our destinations. When is it best to travel to Indonesia? 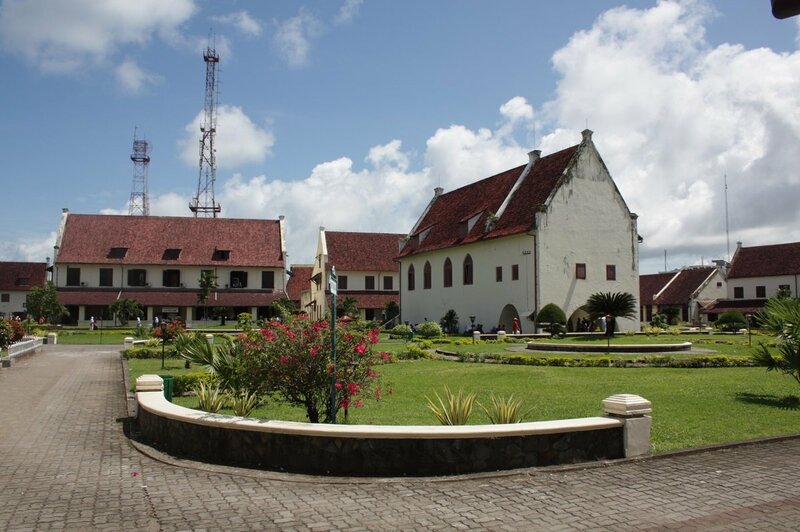 The equator runs through Indonesia, which therefore has a tropical climate. The temperatures do not vary greatly from one island to the next; the biggest differences in the weather have to do with rainfall and the rainy seasons. The air is generally humid, although the humidity level tends to fall at higher altitudes. 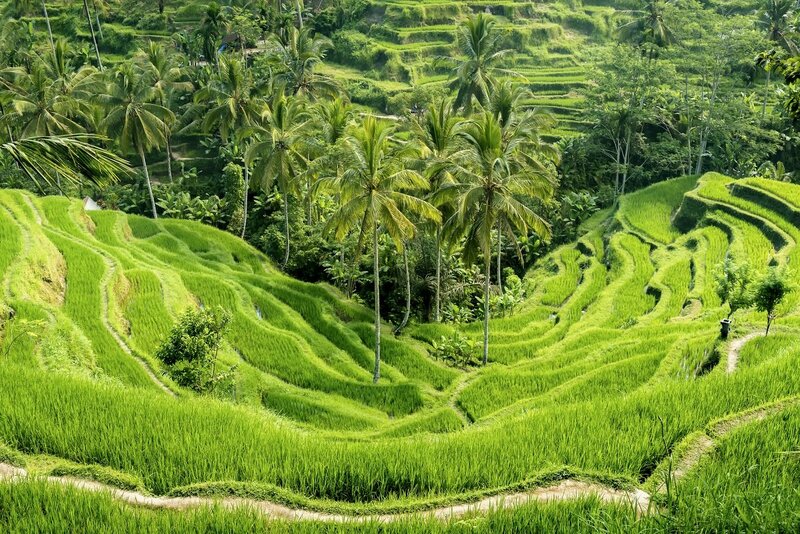 Bali is an extremely green and fertile island, and there is no actual rainy season. It rains least from May until October, most from January to March, with the month of April and October–December as intermediate periods. It is rare for rain to fall during the day – even in the rainiest months – as it typically rains in the evening, usually in the form of short, heavy showers. As a result, the country enjoys a lot of sunshine, even in the rainy months. Even though it may seem cloudy or misty, be careful of the sun – you could still get burned. Temperatures are generally between 22 and 33 °C. It is warmest in the period September–April and ‘coolest’ from May until August. 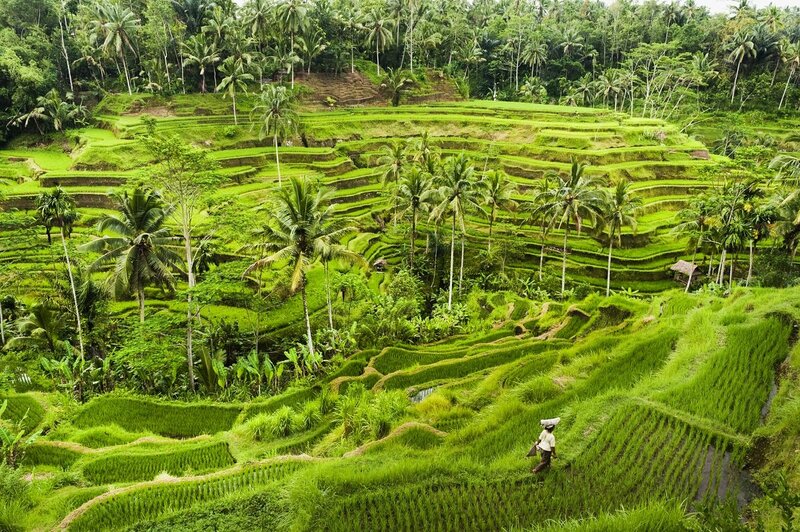 Bali receives around 1,800 mm of rain annually, and around half of this falls between December and March.